Golden pheasants are also known as Blue Gularis Killifish or Fundulopanchax. They are mainly found in Africa and they like to stay in streams or water holes in nature. Actually, the word killifish does not indicate a killer fish but it is taken from a Dutch word which means a ditch. Likewise, Golden pheasants or Blue Gularis Killifish love to stay in shallow waters or in marshes. They are a very good addition to your aquarium because of their different and attractive colors and swift actions. The males are usually found in red and blue colors and they have yellow fins. The females are usually in brown or gray colors and they have a few spots on their body. They are not demanding by nature and they can adjust to living under different conditions of water. The only requirement which should be fulfilled for them is to install many plants in the aquarium. They are happy to live in water containing some salt. Live food is their favorite diet. If you regularly supply them brine shrimps or white worms, they will be very happy to live. Occasionally you can feed them with flaked food and frozen food items. They are large in size and they can grow up to 6 inches. So they should be kept in a bigger aquarium or a pond. If you can provide a 10-gallon tank for a pair, they are happy to stay in. When they are six months old, they are ready to spawn. Younger Golden pheasants can also spawn but they will be producing a lot of infertile eggs. If you want to get a higher percentage of fertile eggs, you should take a pair of at least 10 months old. You should keep the male and the female separately before actual spawning. You can do this by putting a partition in the aquarium. During this time you should provide good food to both of them and you should also keep the temperature of the water around 75 F.
They usually like to lay eggs on mops for on a substrate of peat. You can use a plastic container for the peat moss and put it at one corner of the aquarium. Otherwise, you can use two mops alternatively and collect the eggs from them every day. Usually, it takes about 10 to l2 weeks for hatching the eggs. However, it all depends on the conditions you have created in the aquarium. You should keep these eggs in smaller containers with about 5 inches of well-treated water. The young ones will start eating immediately and you should feed them with baby brine shrimp. The young ones will grow very fast and you should look after them very well by providing them good food and clean water. You should change the water frequently and use a powerful water filter to keep it clean. Once they are six weeks old, you can treat them as adults and you may shift them to the main aquarium. You should always keep small ones of different sizes in separate compartments because the larger fry may attack and hurt the smaller ones. If you want to develop a colorful aquarium with different varieties of fish, you should select Golden pheasants as they will not demand much from you and their presence will please all members of your family. Fundulopanchax gardneri or Blue Lyretail killifish is a big species from the killifish group. There are a number of sub-species found in the nature. These sub-species are found in different parts of the world and there is noticeable difference among each of them. Each one has different color pattern on the body and the size also differs from region to region. The most popular amongst them is the one found in Jos Plateau. This species is originated from West Africa are, mainly from Nigeria. They are famous for their blue body with red spots spotted all over. Their fins are also in sky blue color with a yellow border. Sometimes you will find red stripes on the fins which look very beautiful. You can find all these bright colors in males. However the females are not very attractive. They are shorter in size and wider. They have dull colors and they are slow swimmers. 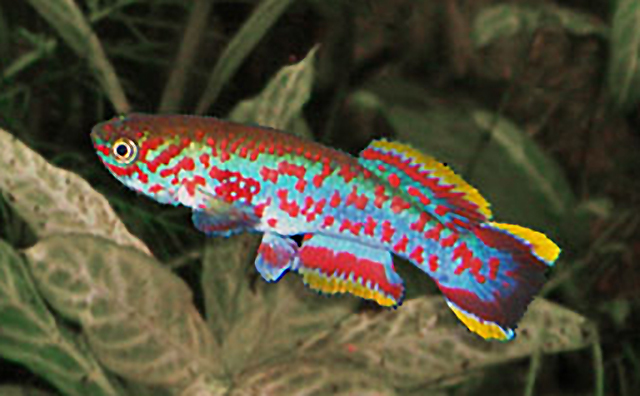 The original environment for Blue Lyretail killifish is ponds which are situated in forests. So when you keep them in the aquarium, you should see that the water is slightly acidic with the ph level of around 7.0 and the temperature should be in the range of 75-82° F.
There should be no movement in the water and the level of oxygen should be high. To maintain the oxygen level, you can keep air stone in the aquarium. As they are small in size, you can accommodate them in smaller aquariums. Breeding Blue Lyretail killifish is slightly tricky. You should create a separate small tank for breeding purpose. Before shifting a pair of male and a female to this tank, you should feed them very well with live food and you should also see that the temperature of the water is slightly increased. In the breeding tank the same temperature should be maintained. Keep the water clean with constant filtration. Ideally, you can change 40 per cent of the water every day. Feed the fish with nutritious diet containing flaked food as well as live food. If you feed large quantity of meaty food like brine shrimp, you can get bigger spawns. From the beginning, you should keep a spawning mop in the breeding tank so that the fish should notice it. Usually, the spawning continues for about two weeks and the eggs will be laid on the mops or on the bigger leaves of plants around them. They will spawn about 20 eggs every day. The female will release the eggs during morning and evening. The eggs look clear and they are about three millimeters in size. Breeders of Blue Lyretail killifish make constant experiments to get best results. The most popular method is to pick the eggs after spawning and keep them in a bowl with low level of water. You should transfer the eggs gently without damaging them. You should change part of the water from the bowl every day. For changing the water you should use the water from the breeding tank for easy hatching. As the time passes, the eggs will become darker and you may be able to notice dark eyes through. You should watch the eggs carefully because if there is any egg which is white or carrying fungus, you should immediately remove it from the bowl. The eggs will hatch if the temperature of the water is correct (around 75 to 80° F). Once the fry start coming out, shift them to another tank and they should be fed right from the first day. They will start swimming around and you should feed them with young brine shrimp. The water of the tank should be changed frequently and the food which is leftover at the bottom should be immediately removed from the tank. In three weeks, the fry and will grow up to half inch and in about five weeks they will grow up to 1 inch in size. Some fry will grow faster than others but you can keep all of them in the same aquarium. The grown-ups will not eat the small ones.